With just a week to go before the World Championship run begins, Drum Corps International's Open Class corps have their noses to the grindstone as they get ready for their big shot at the championship title. 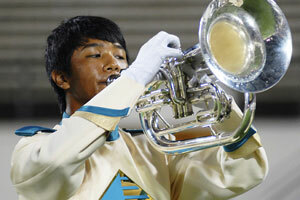 Nineteen Open Class corps are slated to meet up in Michigan City, Ind. 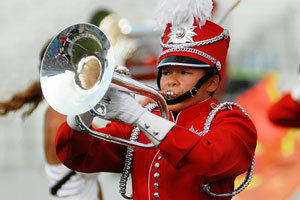 for the first time on Tuesday, Aug. 4, for the DCI World Championship Quarterfinals competition. "Cleaning, cleaning, cleaning!" as Robert Ripley said, is on the agenda for the corps as they squeeze in those last few rehearsals to perfect their productions before the big day. Ripley is the director of the Santa Clara Vanguard Cadets, a corps that is currently sitting among the top three in the unofficial Open Class rankings. He explained that the corps has been performing in California most of the summer and left on tour about a week ago. "Fans should know just how much the kids are having a great time performing the show," he said about their 2009 program, "A Story of Love." "It's a little bit of a different show for us—it's got tons of melody and it's super emotional. The kids are having a great time and we just hope that fans have that same experience." Vicki Schaffer, director of the Colt Cadets, said her corps is working on the things that "add the extra sparkle," and the most basic fundamentals. "Being 'clean' is our priority, which goes back to fundamentals, but the other half is that extra glimmer … anything that adds a bit more color and shape to the big moments and the whole package." The Oregon Crusaders are also perfecting and adding visual excitement to their show, as director Mike Quillen said. "We're very happy with the progress that the kids have made and we think we have a very nice design. We're doing things that nobody else in the Open Class is doing this year." Yet making their shows better is not the only thing the corps are focusing on. "We've been driving home the theme that we are a band of brothers. We're a family. We're working hard to keep that in the forefront of our minds," said Donna Monte, director of Citations. She explained that the corps uses the song "Band of Brothers" from the popular television miniseries as a corps theme song. Monte says that one of her corps members recently discovered the song's Shakespearian origin and the group has been dwelling on the poetic words from Henry V ever since. Mayra Iraheta, director of Velvet Knights, added that keeping the corps members well fed and rested is another main concern going into the World Championships. Luckily for the Velvet Knights, supportive fans have made feeding the corps a little easier lately. "We've had a lot of fans and supporters come out to watch us rehearse at several of our housing sites. They've been so generous, bringing us food and water. They do Sam's Club runs for us and pay for it—it's been amazing! "she explained, adding that fans—with or without food—are welcome to attend any of their rehearsals for a sneak peek at the show or just to say hello. Feeding the corps has recently gotten easier for Citations as well, as they had a season filled with new equipment on and off the field. "We purchased a new food truck and they just finished building it out, and we're all enjoying that. It's made us more efficient and we're able to feed the kids much easier. On the field, we've replaced a lot of our equipment," Monte said. Citations, unofficially ranked third among the Open Class corps, has been competing locally and will begin making their way to Michigan City on Friday, stopping in Ohio and Michigan along the way. Monte said the corps has an unusually high percentage of new marchers—about a quarter of the group—but they've had an extremely successful season. "Things have been going very, very well. We've got an unbelievable group of kids this year and they're working so hard. They're really motivated," she said. "We have a little bit bigger educational staff this year and they've been able to propel the corps too." The Colt Cadets have also had an exceptionally successful season so far and hope to continue that success into the World Championships. "Everything's been going really well this year," Schaffer said. "Our shows have been well attended and our corps is the strongest we've had, and we have a good chance of making the Semifinals this year, which would be the first time in our history that we have. So that's exciting." One thing fans should know, Schaffer said with a laugh, is that the Colt Cadets don't take kindly to being called "cute." "We'd rather be considered good than cute," she said, noting the number of corps members in their late teens. "Yes our operation is younger than everyone else, but that doesn't mean we're all young." One of the highlights for the corps was their June 30 hometown show in Dubuque, Iowa, which was completely sold out. Schaffer said they even had to open up the back stands for spectators for the first time this year. 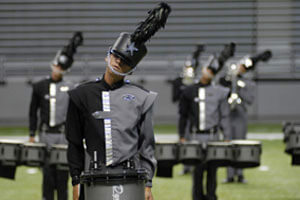 The strength of their 2009 production, "Lullabye and Good Nightmare," is one reason why the Colt Cadets have been so successful this year, Schaffer said. "Our programming was right on from the get-go this year. We only had to change a few things, so we've been able to add and enhance the program a lot more because we haven't had to spend time changing the show. It's also been exciting to work with some really great consultants," she said. Don't miss all the exciting performances from Open Class corps next Tuesday, Aug. 4, in Michigan City, Ind. Performances start at 2:30 p.m. at the venerable Ames Field, which was recently updated with a brand new artificial turf surface. Mike Pease, the local organizing committee chair for the event, said, "I think we do a really good job here, and people like coming to Michigan City because the atmosphere in the stadium is so nice. It's going to be really good this year with this new field." Prior to the Open Class Quarterfinals, a special World Championships opening ceremony will also be held in Michigan City on Monday, Aug. 3, at 6 p.m. The ceremony, along with the Quarterfinals, is part of the Michigan City Summer Festival, a series of more than 50 events in the city that run from mid-June to October. The ceremony, which is free and open to the public, will feature performances by Legends and Velvet Knights. Mayor Charles Oberlie and DCI Executive Director Dan Acheson will welcome the corps and fans, while the Michigan City High School Junior ROTC Honor Guard will add to the festivities with the "Parade of Flags." 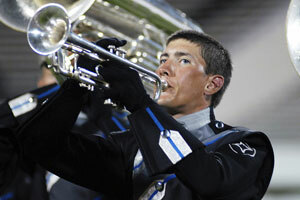 Learn more about all Open Class World Championship events at DCI.org/indy.